A look back at "New Orleans Music in Exile"
Ten years ago this Saturday, Hurricane Katrina struck the Gulf Coast, displacing hundreds of thousands of residents and causing massive damage to the southern states. 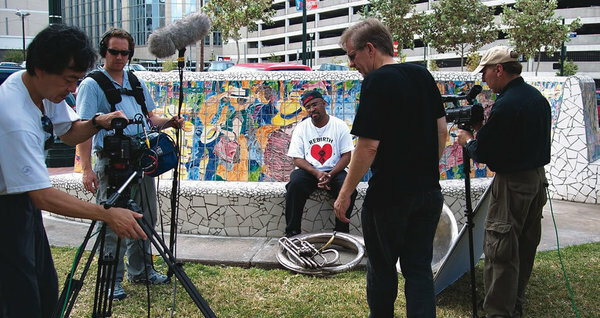 With the country recoiling from the blow, filmmaker Robert Mugge, who has been documenting our Zydeco Crossroads journey this year, captured the devastating shockwaves and glimmers of hope surrounding the hurricane in his 2006 documentary New Orleans Music in Exile. Among the region’s evacuees were the many artists that give Louisiana its colorful spirit, forcing them to find refuge in nearby states. Mugge traveled west to Texas and north to Tennessee and Pennsylvania to find the musicians who were exiled from their homes. Theresa Andersson performs Neil Young’s “Like A Hurricane” in Robert Mugge’s film NEW ORLEANS MUSIC IN EXILE from Robert Mugge on Vimeo. Dr. John performs “Walk On Gilded Splinters” from the Robert Mugge film NEW ORLEANS MUSIC IN EXILE from Robert Mugge on Vimeo. Cyril Neville’s Tribe 13 performs “I WIll Survive” for Robert Mugge’s film NEW ORLEANS MUSIC IN EXILE from Robert Mugge on Vimeo. Marcia Ball performs Randy Newman’s “Louisiana 1927” in Robert Mugge’s NEW ORLEANS MUSIC IN EXILE from Robert Mugge on Vimeo.